I was eagerly anticipating the television mini-series of Kate Grenville’s bestselling novel The Secret River, a story of conflict between the First Australians and early European settlers, which recently aired on the ABC, both to see how the story played out on the small screen, but mostly to see the beautiful scenery of the Hawkesbury River, around which the story is set. Unfortunately, the remaining pristine bush along the Hawkesbury is pretty inaccessible to film crews, so much of the filming took place on Lake Tyres, near Lakes Entrance in Victoria. However, there were some aerial shots of the Hawkesbury, a magnificent river that flows into Broken Bay. I spend a lot of time boating on Cowan Creek, a tributary of the Hawkesbury, which is cocooned in Ku-ring-gai Chase National Park, so I’m familiar with the rugged sandstone country that featured so strongly in the book. This picture of Smiths Creek, a tributary of Cowan Water, is taken from a lookout on the road to Cottage Point, the only pocket of residential land inside Ku-ring-gai Chase National Park. There are numerous bush walks within the park, including many beside the water, which give a feel for the country of the Dharug people and hints at how difficult life must have been for the early settlers to the area. 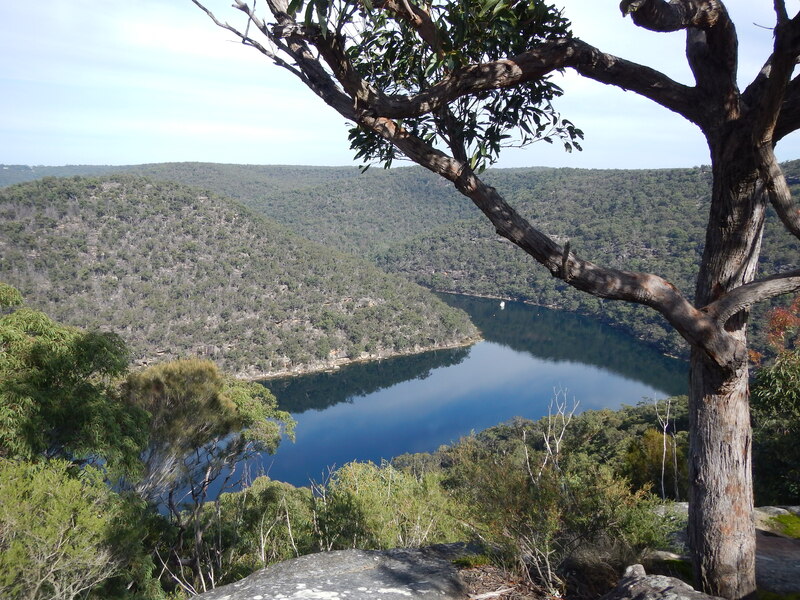 More: If you’d like to do a tour of Ku-ring-gai Chase National Park, you might like to read my story on Sydney Out Back which combines bush walks and boating. This entry was posted in Australia, Hawkesbury, National Parks, Postcards, Sydney, Travel and tagged Australia, Cowan Water, Hawkesbury, Hawkesbury River, Ku-ring-gai Chase National Park, sydney. Bookmark the permalink. Interesting read. I had no idea it wasn’t the Hawkesbury I was seeing in the TV series. So the camera never lies, eh? Amazing to think the pioneers managed to grapple with the bus yet today, with all the modern tools at our disposal, the film crews couldn’t quite hack it. Hi Rob, I’m sure a lot of people who watched the series didn’t realise it wasn’t filmed in the Hawkesbury area. It was probably more a matter of bureaucratic accessibility for the film crew, as much of the remaining bushland in the region is National Park and I imagine NPWS aren’t that keen on film crews working in the parks.